From my side of the desk, TS kept telling me about kısır, about how Turkish ladies get excited about kısır. Of course, all the while, not really describing what the dish was. 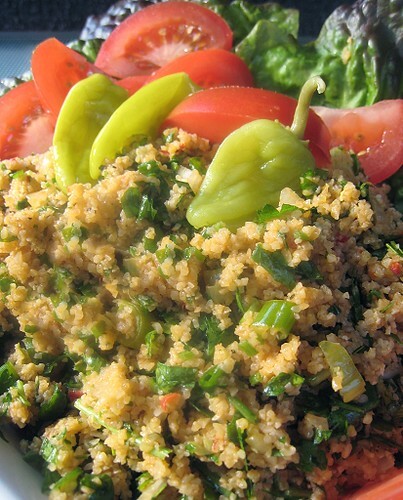 Taste-wise, I had imagined it would be a more bulgur-y tabbouleh (as opposed to a parsley-y tabbouleh), and I was quite looking forward to tasting it. 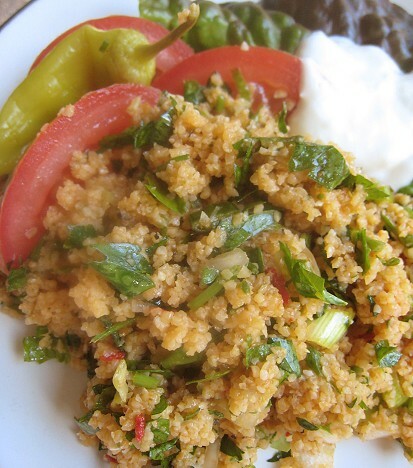 Besides, when we were narrowing down our choices for Turkish dishes to make, I couldn't leave out making something with bulgur! It seemed quite a large part of Turkish diet. 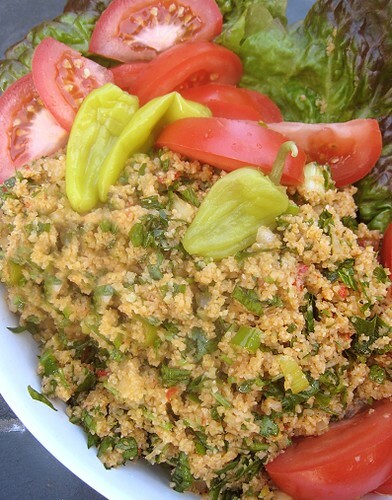 To make kısır, we start with the bulgur. 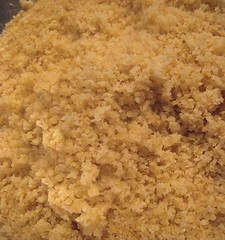 I used fine bulgur wheat (there was coarse, medium and fine available). It was a simple 1:1 ratio of bulgur and hot water. In this case, I followed the recipe from Almost Turkish Recipes and added tomato paste and red pepper paste to the hot water. 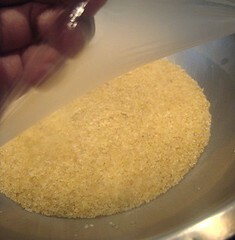 I combined the bulgur, hot water and the pastes in a bowl, covered it, and let the liquid soak for about 10 minutes. Afterwards, I fluffed it up with a fork. Then, it was just a matter of adding the ingredients and mixing them all together. In went olive oil, green onions, cucumber and lemon juice. The recipe called for kneading an onion with salt, rinsing the salt off, and squeezing away the excess liquid. I, of course, was too lazy to do that, so I simply added the onions raw. I also didn't have any banana peppers on hand, so I used some pickled pepperoncini instead. The rest of the ingredients were dried mint flakes (which we shopped for in preparation for making Turkish food), a little cumin, Hungarian hot paprika (the recipe called for "red pepper flakes" but I wasn't sure if it was the normal red pepper flakes; hence, the paprika), salt and pepper, and a whackload of parsley. The "secret" ingredient: pomegranate syrup. Kısır is served with lettuce, tomatoes, and/or pickled peppers. Reading the ingredients, I thought I knew what this would taste like. But, I was wrong! I liked the tartness it got from the lemon juice and the slight "crunch" from the cucumbers and green onions. It was savory, yet was very refreshing. It wasn't spicy at all but there is a nice heat and warmth from the paprika and red pepper paste. Then, the pomegranate syrup gave it a totally different dimension, making this unlike anything I've tasted before. It gave the dish a certain je ne sais quoi that, well, I can't describe! Kısır would be great to have around in the fridge to be pulled out for an instant snack, like in afternoon tea. And, in Turkish manner, enjoyed in the company of friends. I must admit I've never tried any Turkish food before - but this looks rather tasty. Now Turkish coffee on the other hand...we're great friends. Eventhough Turkey is nearner to Spain than to Canada, I never thought about preparing a dish like this... maybe I should roll my sleeves up and start with your recipe :D. Great job! Want to dive into an Omelet sea? This looks wonderful! 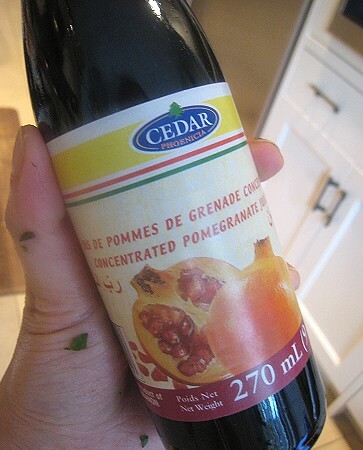 I've often seen the pomegranate syrup at the local lebanese market but haven't found enough recipes to use it in. This one is great so thank you for sharing! Yeah, we're still at a loss of when/how exactly to use pomegranate syrup. That is, we use it when we want to achieve ___? Like Sweet bird said, I haven't come across any Turkish dishes either. But this does look delicious. Is this spicy though? I noticed the pepper sauce in one of the photos. Thanks for the visit. Actually, this wasn't spicy at all. 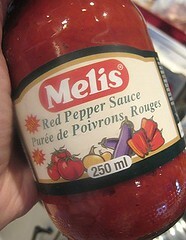 There was only a tiny bit of the red pepper paste, so it just gave a background flavor but wasn't very prominent.